Working with my webdesign and marketing company, we asked the question 'what do Pathway Balancing clients need help with the most?' After researching the past four year's practice records, we found the answer. The biggest problems are physical and structural ones and the area most affected is the head and neck region. People have been coming for help with headaches, neck tension, blocked sinuses, migraine, tinnitus, vision disturbances and a lost sense of smell. These problems can be helped with both craniosacral therapy and kinesiology, according to the client's preferences. A good course of action may be to start with craniosacral therapy sessions to ease the physical pain and tension. As symptoms improve, moving on to kinesiology can uncover and deal with the root causes, so preventing a recurrence of the problem in the future. Why is the head and neck region such a problem? The plastic model in the therapy room shows the junction between the head (cranium) and neck bones (vertebrae). The red plastic shows the pathway of the arteries and the yellow plastic shows the nerves from the spinal cord. The head sits on the top vertebra, which is called the Atlas bone. 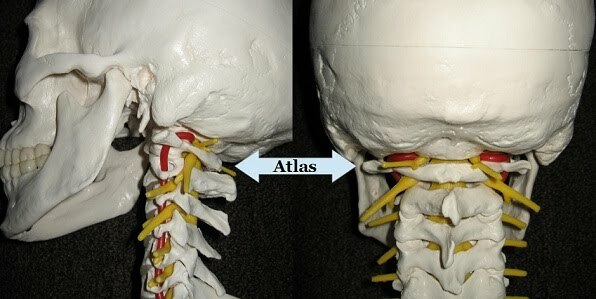 The Atlas bone can swivel around by almost 90°, allowing our head to rotate so we can look around us. The seven bones in the neck (cervical vertebrae) can compress down backwards (extension) or open up forwards (flexion) to allow us to look up or down. As we move in any combination of these directions, the many muscles around this area must contract or relax in balance with each other. If there is tension, tightness or stiffness in any muscle, the movements can become restricted, uncomfortable or even painful. As the model shows, tightness in the head and neck region can also affect the blood supply to the brain and nerve-signals along the spinal cord. The brain and spine are also bathed in a fluid called cerebro-spinal fluid (or CSF) which needs to flow freely around and out of the head. When head and neck muscles are constantly tense, our brain cannot maintain a fresh supply of blood, the CSF can't drain away and nerve impulses are distrupted. We can feel this stagnant fluid backing up between the eyes, just above eyebrow level. The pressure then causes a heavy, groggy head and we can't think so clearly. Over time, the sinuses might become inflamed and produce mucous to cool things down and kill off multiplying bacteria. Trapped nerves could begin to produce a ringing in the ears or vision disturbances. This downward spiral needs intervention as soon as possible. Have a drink of water, take a short break for some fresh air, get moving to help circulation, avoid the computer screen or TV for a while, lay down on your back for 5-20 minutes if possible, have an early night, and pay attention to posture throughout the day. 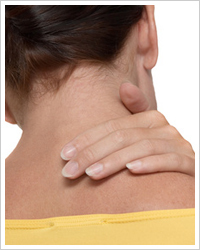 Head and neck problems can have many root causes that can't be resolved by simple self-help techniques. Almost everyone has residual damage from the compacting forces of simply being born, let alone all the minor or major childhood slips and falls. Some people go through extensive dental treatments, road accidents, or even physical assaults that can leave the head and neck muscles misaligned. The journey of life can be an emotional one and stress is commonly held in tension around the jaw, eyes, throat or back of the neck. All of these stresses and tensions can be addressed gently yet effectively with hands-on treatments like kinesiology and craniosacral therapy. Releasing tension allows energy to flow again and can produce results that go far beyond simple pain relief. Newer PostA Breakthrough or Defeat?